Thud. Silence. Thud. Silence. Thud. While the village slept, Tara chopped the wood, a little bit everyday to prepare for winter, a little bit for cooking. She moved inside the two room home, lighting the kindling flames with her breath. A traditional stove, the tourists who came called it, but her name was simpler, smaller: chulha. Her mother taught her how to use it, how to gently fan the first flame by blowing slightly, steadily. Tara could not teach her own daughter, who studied in the big town. Instead, she taught her niece, now almost a woman. Shyama was still asleep. That girl, thought Tara, only sleeps and looks in the mirror, a complaint she had conveyed to her sister-in-law just yesterday in the lower part of the village. Tara walked down the cement road she had authorized last year, when she got elected as Pradhan. Photograph by Nikhil Gulati. As the wood gently crackled, Tara heard the irregular snoring of her husband. He would be up soon. Her mind raced with the list she had memorised, things he had to buy when he returned from work in the evening. She mixed yesterday’s lentils with water and flour, adding salt, turmeric, and green chillies to the runny batter. Tara ladled the mixture onto the pan, watching it sizzle, cooking quickly. Gently, she lifted the edges, checking their brown-ness, before flipping it over in one swift motion. Remembering the first time she had cooked cheel for her husband, Tara chuckled to herself. Its veinous underside had turned black, not the caramel brown she saw now, and he had eaten it anyway, the poor man. That was fourteen years ago. She hadn’t looked at him for at least a week after the wedding, Tara recalled. One day, she was washing her clothes when she saw a tall, broad-shouldered man walking nearby. “Who’s that man?” she had asked her sister-in-law. “Pagli, that’s your husband. Silly girl.” They had giggled afterwards, for it is what one did at seventeen when faced with situations they didn’t know the response to. Tara packed some of the cheel in her husband’s lunch box and stacked a few in Shyama’s tiffin. She nibbled on the ones left over, dipping bits into chunks of mango pickle, dribbling with mustard oil. Shyama awoke, groggily grabbing the broom to begin her morning chores. She’s a good girl. Her thick braid was dishevelled, her dupatta torn, but Tara could tell her niece was beautiful, much more than she had been. That Shyama did not dress in sleeveless shirts and jeans, like some of the other modern girls, Tara was relieved. She’s a good girl. Marriage offers were already trickling in from nearby villages, but Tara wouldn’t hear of it. Shyama needs to finish school, to go to college in the big town. So what if her body has grown? She is still a child, her mind needs to grow. As her husband got ready for work, Tara washed the clothes. She plucked the ripened cucumber off the tree, dug out pieces of ginger, watered the flower bed, and loosened the soil to plant turmeric. She dusted the mattresses and stitched the tear in her salwar. As her husband left for work and Shyama joined her friends walking to school, Tara washed her hair and wore a clean set of clothes. She flung a thin shawl around her shoulders and walked down into the village. Tara succumbed to their insistence. They mean well, she thought, sipping the milky tea. And yet, she felt guilty, knowing they used most of their daily milk on her tea. Their own chai will be runny today. Tara walked down the cement road she had authorised last year, when she got elected as Pradhan. The village was clean, save for a few bags of chips and biscuit wrappers strewn on the pebbled path. She made a mental note to install dustbins. 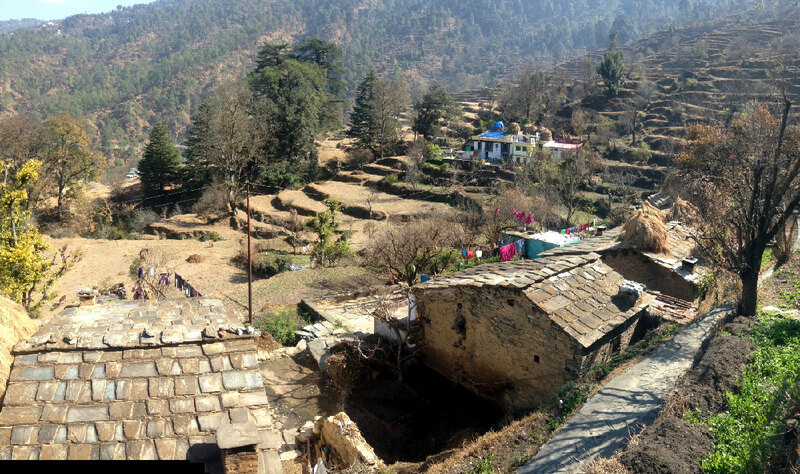 Her walk culminated at the tiny home of Shanti and Raman, a childless couple staying at the foot of the village, near the main road. Raman, like many men in the village, drank excessively and reports of beating had spread through the village. Tara was here to settle the dispute. Wearing their farming clothes, bent at the waist, they greeted her with folded palms and offered chai. She moved into their meagre hut and sat on the shiny plastic mat Shanti spread out for her. Individually and then together, she listened to their versions of the story. Then, she drafted a note which she read out to both of them. “It is important,” Tara read, “for a married couple to live in harmony. If two people are not able to live in harmony, it is because both husband and wife have contributed to the problem. In this case, Raman bhai comes home after drinking and beats Shanti, which he denies. However, Shanti has bruises on her arms and legs which prove otherwise. Raman bhai claims that he drinks because he wants to get away from Shanti’s nagging, which she says is untrue. Tara paused to check their response. Shanti looked at her with folded hands, while Raman looked remorseful. A wife taking another man would insult him greatly. She continued. Raman quickly pressed his thumb into the ink pad and onto the paper, while Shanti did the same with some hesitation. Tara took their leave shortly after. Walking away, note folded neatly in her purse, she saw their folded hands frozen in front of their chests, their eyes following her up the path. Such disputes often came to her, and as their elected Pradhan, she had to think of creative solutions. Maybe the beatings will stop, maybe they won’t. That evening, Tara lit the chulha, her husband chopped vegetables for dinner, Shyama kneaded the dough. She should be studying, I’ll do the dishes tonight. She looked at her family with affection, turning to blow her breath into the tiny flame. Written with ease and flowing smoothly as one of streams in the hills…true slice of life! Enjoyed every bit of it.